Grit Guard is actually the name of a company. It’s often used to describe the Grit Guard insert. The Grit Guard insert is a settling filter that was developed some time before 2001, when the Grit Guard company was founded. It is a plastic grate with fins extending below it that is placed into the bottom of a bucket to help separate and trap sediments in the bottom of the bucket. Do Grit Guards really work? How? Believe it or not, they really do! There are three primary premises of the Grit Guard insert that make it successful. The first premise is that it blocks you from being able to touch the bottom of the bucket with your wash mitt or sponge. The bottom of the bucket is where the heaviest sediments settle out of the water. You don’t want to reintroduce these sediments to your wash mitt by accidentally dragging it across the bottom of the bucket. The Grit Guard prevents this. The second premise is that it dampens the current of the water that is swirling around your bucket. Once dirt particles drop below the level of the grate the water it falls between the fins to the bottom and remains there. The fins prevent the swirling water at the top of the bucket from swirling the water in the bottom and lifting the sediments back out. To better understand how this works take out a cup and fill it with water. Take a large spoon and begin stirring the water. Now stop the spoon in place and watch the water. The spoon acts as a brake and disrupts the movement of the water. If there were any heavy dirt particles in that water they would begin to fall to the bottom once the water stopped. Finally, the third premise is that the Grit Guard insert acts as a washboard of sorts. It provides a rough surface for you to agitate or rake your wash mitt or sponge against to dislodge any dirt or foreign objects from the wash mitt or sponge. The dislodged particles will then fall to the bottom of the bucket. These days, Grit Guard even sells an add-on for the insert that adds an angled grated section for easier raking of your wash mitt or sponge. They call it the Washboard. The angle allows you to rake the mitt up and down instead of having to twist it as you would with the horizontal insert. This is a good accessory for those who may suffer limited mobility in their wrists. Do I really even need a Grit Guard insert? If you intend to prevent scratching the surface you are cleaning, yes you need a Grit Guard insert or something equivalent. While no one tool or accessory will guarantee that you won’t damage your paint while working on it, they will guarantee a higher chance of not harming your paint when used together. The Grit Guard insert costs anywhere from $7-$10 dollars from retailers such as Amazon. That is less than most people spend on single trip to fast food. The Grit Guard is something that you’ll get to use over and over for years. It really is a solid investment. Your children and their children will probably get to use it on their own cars. Heck you can even get the Grit Guard insert and a nice bucket for a little over $20 such as seen here. Can I make my own Grit Guard insert? Of course. There are examples online of people fashioning them out of industrial light diffusers and other similar materials such as this one. Though at $10 a piece the economies of time vs money don’t quite stack up. You’ll likely spend $10 in materials, provided you don’t have them laying around, and invest considerable time making it work vs just dropping it in. I’m the king of DIY in my house and even I couldn’t justify making my own. If you have literally nothing else to do and already have some materials on hand, go for it! It’s not a complicated or magical design. How many Grit Guard inserts do I need? Typically you will need two. Many retailers even sell them in 2 Packs for a discount. You will put one in the bottom of your wash bucket and one in the bottom of your rinse bucket. I advocate using two buckets for washing anything. One for clean, soap water and one for dirty rinse water. This is referred to the two bucket method (which I talk about in my article How to Wash Your Car Without Destroying Your Paint). It provides the greatest probably of you not reintroducing dirt that you have removed back to the surface you removed it from. I’ve tested stacking Grit Guard inserts to try and achieve better sediment separation and I was unable to perceive any difference or added benefit. There are a few online retailers that push multiple inserts in each bucket but I’m confident that’s to sell more inserts. As always, if it helps you sleep at night, go for it. Is the Grit Guard Wash Board a Must? The Grit Guard Wash Board has minimal real world benefit. About the only thing it accomplishes well is giving you a more comfortable angle to rake your wash mit out in the rinse bucket. Ergonomics aside, I can’t justify the Wash Board a “must have” for most people. What color Grit Guard inserts should I get? I recommend getting two different colors. I personally have black and blue. I put the black one in my dirty water rinse bucket and the blue one in my clean water wash bucket. This allows me to have a quick visual queue as to which bucket the gross stuff goes in. What is the Best Bucket with Grit Guard Combo? 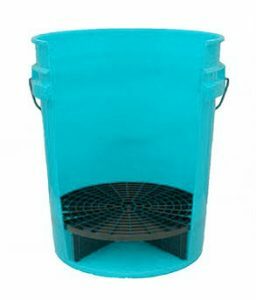 I personally think one of the best deals out for a bucket with grit guard is the Adam’s Grit Guard Wash Bucket with Lid. You could go to Home Depot or Lowes and buy their bucket (around $3-$4) , a grit guard ($10), and a gamma seal knockoff lid ($7-$8) for a total of $22 ish dollars. Unfortunately, they like to change the size of their buckets on occasion so you’re not guaranteed to get your grit guard to sit all the way in the bottom. For only a few dollars more you can get a much more attractive looking bucket setup delivered to you with a genuine gamma seal lid and the peace of knowing everything is going to fit. I think the $27ish dollars the bucket costs shipped is worth it considering the several years to a decade or more of use you’ll probably get out of it.